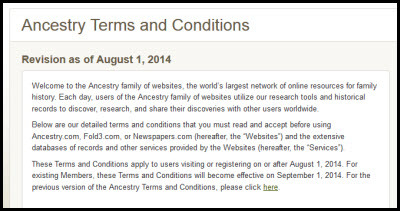 • For Ancestry.com, please call (800) 262-3787, send an email to [email protected], or visit http://help.ancestry.com/app/home. • For Fold3.com, please call (800) 613-0181, send an email to [email protected], or visit http://www.fold3.com/contact. • For Newspapers.com, please call (877) 519-0129, send an email to [email protected], or visit http://www.newspapers.com/contact. In other words, we can’t copy all of, say, the 1940 census directly from Ancestry and resell it on our own websites, but we’re perfectly free to use any specific census record — or even a subset of records — to illustrate our own family histories or those of clients for whom we may be working. What that means is that if Aunt Mabel decides to sue Ancestry because you uploaded her copyrighted picture of Uncle Homer wearing a grass skirt, and she wins, you could end up paying not only the full amount of the copyright award and your own legal fees and Aunt Mabel’s legal fees, but all of Ancestry’s costs and legal fees too. Fourth, any dispute you have with any of these companies now has to be handled through binding arbitration or through a small claims court proceeding in Utah under Utah law.10 Binding arbitration means no judge, no jury and no right to appeal to a court if you don’t like what the arbitrator did. The only court review of binding arbitration is if you can show that the arbitrator acted illegally, not just stupidly. For most of us, this doesn’t mean much, since we could still choose to go to the Utah small claims court — and that’s allowed for any claim up to $10,000 in damages.11 I don’t expect most of us would ever have a claim we could even arguably make as users of these websites for more than that amount. Bottom line: there’s not much change here, except to reinforce that we need to be careful about what we upload. Violating someone else’s rights could be very expensive. Thank you for keeping us up to date on all these changes. Trying to keep up with them is a nightmare. I am new to this genealogy research and I am blown away with the information that I finding available. I thought about doing this back in the late 90’s and it was hard to find information…this 15 year difference has made it easier to find my grandparents, great grand parents and etc….it has opened up a new world for me. I am glad that I have found your site…you have great information. It’s certainly easier to find information online today than even a few years ago, Chris — but be aware that there’s still only a tiny fraction online. The vast majority of the records that might exist are not digitized, not online — and won’t be in our lifetimes! I personally read this language as allowing me to use any single clipping from any newspaper that is in the public domain (that is, published before 1923), to illustrate a blog post or a lecture without securing specific permission from Newspapers.com. The relevant language of the terms allows “professional family history research” as well as personal use, and the ambiguity between the two sections (“professional family history research” and “personal use”) would generally be construed against the writer of the document (Ancestry). If Ancestry doesn’t want me using these images, they can tell me so clearly. Ohmygoodness, Judy. You were gracious enough to take time and respond (fairly immediately) to my question above and I am only now, a year later, seeing that you responded! Please don’t think me ungrateful of your time or knowledge, just know I am not always the most computer savvy individual. THANK you for your input––sincere apologies for the late thank you!